INDIANAPOLIS (AP) Helio Castroneves and Sebastien Bourdais each tried to make the most of a rare passing opportunity during the second half of Sunday’s Indianapolis 500. On an unseasonably hot and humid day, four of IndyCar’s top names left the season’s biggest race the same way – with a trip to the speedway’s infield track center following crashes. Takuma Sato collided with a slower car, too, costing him any chance at winning a second straight 500. While Will Power captured his second straight win and pole-sitter Ed Carpenter finished second, a four-time series winner, the defending race winner and three drivers who became fan favorites for their consistently impressive performances at the world’s best-known speedway suddenly were victims of circumstance. The sun-drenched track wore down tires and left so many rubber pellets that track workers used sweepers to clean up after Bourdais’ crash on Lap 139. Those conditions were complicated by the new aero kit, which made passing difficult and handling a real challenge. All week drivers warned the race could be tricky and they were right. Bourdais, of Dale Coyne Racing, saw his championship hopes damaged. Despite being the fastest Honda qualifier and leading the first laps of his career at Indy, he finished 28th and slid from third in the standings to eighth. Castroneves, the popular Brazilian with Team Penske, faced a similar fate when his car spun in the same turn seven laps later. As a result, his pursuit of record-tying fourth race win must wait one more year. He’s 0 for 9 since last winning in 2009, failing this time after spending much of the day in or near the top five. He finished 27th – only the second time in 18 starts he failed to finish the race – and fans gave him a roaring ovation as he climbed out of the No. 3 ”yellow submarine,” seemingly urging to come back next year. ”It’s hard to say no to him, isn’t it?” Roger Penske said. Team President Tim Cindric confirmed Castroneves would be back in 2019. 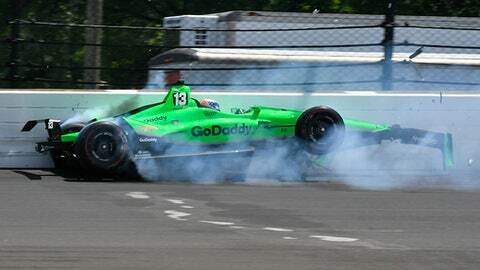 Kanaan, the 2013 Indy winner, led the third-most laps (19) and was in contention until suffering a punctured tire. Then the Brazilian’s good run ended the same way, with a spin into the wall with 11 laps left. He was 25th in A.J. Foyt’s trademark No. 14 car. ”I’m not trying to make an excuse. I made a mistake trying,” he said. Sato never had much of a chance to become the first back-to-back winner since Castroneves in 2001 and 2002. He ran smack into the back of James Davison’s slower car on Lap 47 – one of only two crashes that didn’t involve a spin. One of the biggest disappointments was seeing Patrick’s ballyhooed retirement party end so early. Her No. 13 car spun into the wall on Lap 68. She finished 30th in her final race, only the second time in eight Indy starts she missed the top 10.